Equation of the cylinder with radius R and axis (O, ) with : . Cartesian parametrizations: or (cf figure on the right). 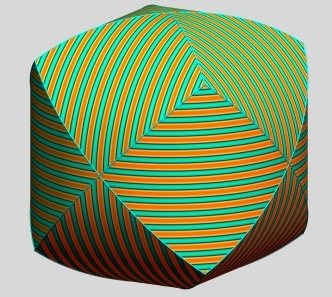 First fundamental quadratic form: . Second fundamental quadratic form: . 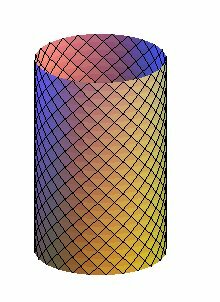 Parametrization the coordinate lines of which form a double lattice of orthogonal circular helices, which are also the rhumb lines at 45° of this cylinder (be it placed horizontally or vertically). The cylinder of revolution is the surface generated by the revolution of a line parallel to an axis, around this axis. 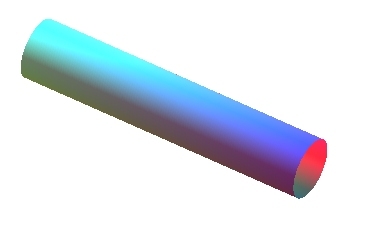 The cylinder can be developed by mapping a point M to the point of the plane with Cartesian coordinates . - curvature lines: the circles z = constant and the generatrices. - geodesics, helices and rhumb lines: the circles z = constant, the generatrices, and the circular helices. See also the cylindrical curves, and the equidomoids.